Travelling to the NT? Why not see how native cuisine is prepared by a master? Quentin Long meets Mark Olive. Mark Olive, aka the Black Olive, is a fierce advocate of Australian cuisine. Yes Australian cuisine, not fusion-Asian-modern-Australian, but the truly unique food comprised of the flavours from our equally unique flora and fauna. He is here for the launch of the Uluru Feastival – a quarterly foodie event that celebrates the native foods of Australia. It is part of the ongoing renaissance of the Rock and forms the signature event of the Bush Tucker Journeys program. 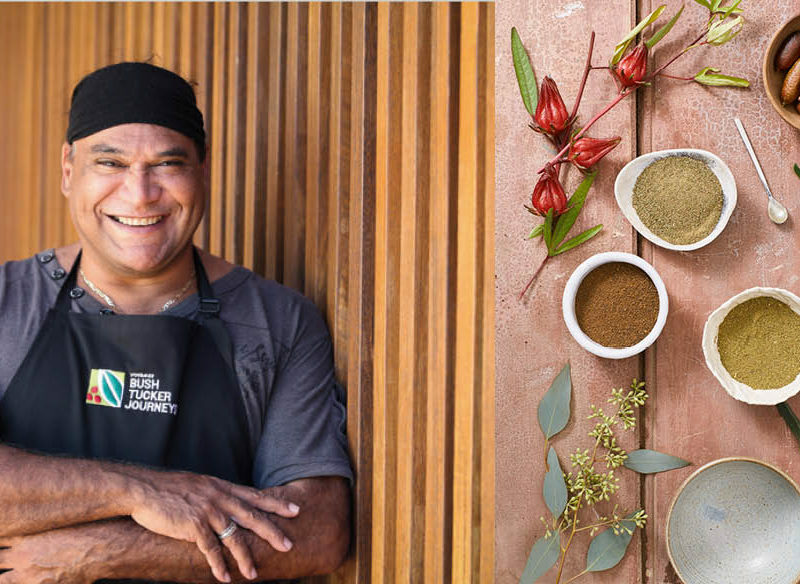 For 30 years Mark has passionately tried to change the perception of our Indigenous produce and ingredients by educating kids, for instance. The barriers to this Indigenous food being used in more kitchens are more mental than anything else. For Mark, the first steps are simple ones: stocking the pantry. But if you are unfamiliar with the ingredients, how do you make sure you are finding good produce? 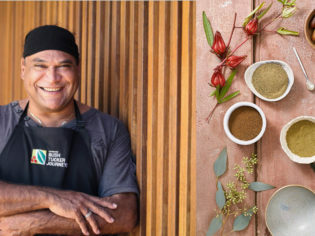 Uluru Feastival is a two-day celebration of native ingredients, including a foraging walk, a masterclass with Mark and dinner under the stars. Packages are available, including three nights’ accommodation. Visit Uluru Feastival for event dates and bookings. Café-restaurant Geckos, where lunch consisted of fresh salads, gourmet pizza and fresh king prawns – a logistical feat considering the café is 500 kilometres from anywhere. Pioneer BBQ and Bar, at the Outback Pioneer Hotel and Lodge. It’s as gritty and ‘country’ as it sounds – and great for just that reason. Come here for a beer, a chat and a cheap pub meal. Arnguli Grill at Desert Gardens. This is our overall pick for food – a lovely, contemporary menu using modern ingredients and unpretentious recipes. It was undergoing refurbishment during our visit, but Ilkari Restaurant at Sails in the desert comes highly recommended by other travellers. Finally, Tali Wiru is an absolute must-do – expensive at $360 a head, to be sure, but worth it. If it’s booked out – and be warned, it does – long-time favourite Sounds of Silence offers a similar option.